Office partitions are a great way to break up the space of an open plan office. Using a combination of large to small solid and glass office partition systems create modern and funky spaces of varying sizes. Look at our design ideas to see what you could do with office partitions. An increasingly popular addition to modern office spaces is office pods. These can be used as meeting rooms and breakout areas of which can be achieved using partition walls. They are a really great way to create privacy without isolation as the glass lets light through but offers a level soundproofing. See how we achieved this for Ameriscot. Offer transparency and sound reduction by using wall partitions to create meeting rooms. Keep the design consistent with the rest of your office and use these rooms to express your company’s ethos. Furnish with a table, chairs, a screen and if space allows, have an area for tea, coffee, water and biscuits. We also have specialist acoustic wall partitions for when you need that extra bit of privacy. The image below is of one of the meeting rooms we created to achieve this for Sports Direct. Breakout areas are great for your team’s productivity. They offer a place for employees to relax, eat their lunch or hold informal meetings. The HSE suggest we should take a 5-10 minute screen break every 50-60 minutes and breakout areas are a great way to allow your team to take informal breaks. Here they can work on other tasks, away from the screen. When designing your breakout area, think about your brand and how this space will reflect your brand values. Fill the space with comfy chairs, plants and a rug, giving people the opportunity to change their setting and be more productive. To discuss your office partition design ideas and to find out more about how Applied Workplace can help you, get in touch with our friendly team on 01202 577776. 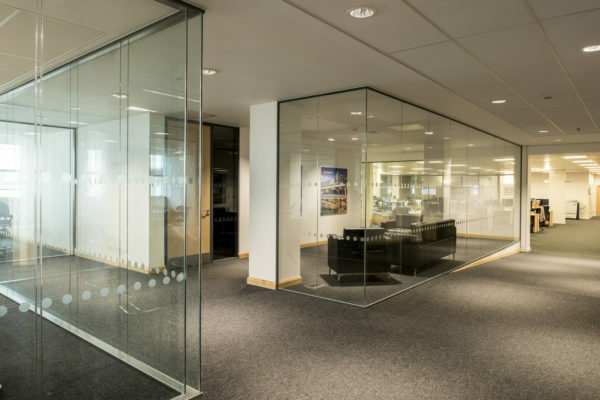 For a price for glass office partitions, use our free quote calculator.